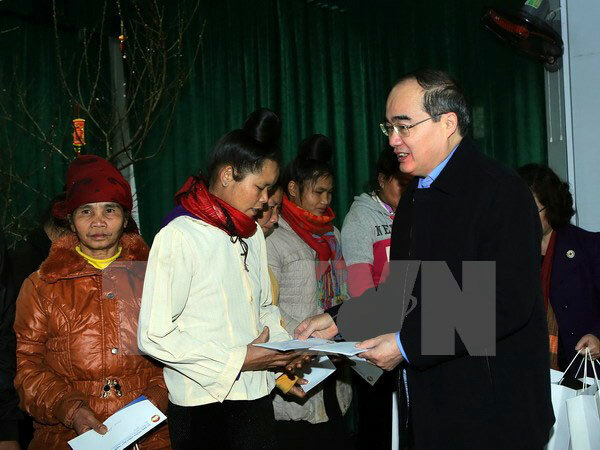 President of the Vietnam Fatherland Front (VFF) Central Committee Nguyen Thien Nhan visited and presented gifts to poor households and welfare policy beneficiaries in the Northern mountainous province of Son La on January 14-15, ahead of the Lunar New Year (Tet) festival. Talking with local residents in Chieng Co commune, Nhan said he was delighted to know that the commune has established a coffee cultivation cooperative, saying that it is a right direction and the locality needs to build an irrigation system to increase coffee output. The same day, the Front leader held a working session with the provincial Party Committee and VFF chapter to discuss the development of agricultural cooperatives in tandem with sustainable farm production and consumption. He spoke highly of the province’s strategic determination to shift to fruit cultivation and expand cooperative models, suggesting that Son La should seek high-quality seedling suppliers and establish a cooperatives alliance which is responsible for supplying fertilisers and plant varieties. Nhan also asked the provincial agriculture and rural development sector to train a contingent of cooperative leaders, and described Son La as a promising destination to host a conference on building new-style cooperatives hosted by the VFF Central Committee in the coming time. Speaking at the event, Secretary of the provincial Party Committee Hoang Van Chat said Son La currently records 261 cooperatives, including 30 involved in fruit tree growing and 16 others in vegetable cultivation; and 18 farm produce production g and consumption chains. As many as 41 firms and cooperatives with 84 products have met Vietgap food safety standards. This year, one of Son La’s priority tasks is to grow more fruit trees on slopping land areas, launching Vietgap production and consumption chains, and building brands for its products, he said. Also on January 14, Nhan attended a get-together of border guard officers, soldiers and residents in border areas of Moc Chau district. The organisers presented gifts to 300 poor households, 1,000 gift packages and 50 scholarships to needy students worth a total of more than 500 million VND (21,700 USD). Earlier, the Border Guard High Command coordinated with the Long Sap Border Station to hold cultural and sport events, folk games and glutinous rice cake wrapping competition in the lead up to Tet./.